I watched this film at the suggestion of Hot Fuzz. Until that movie came out, this movie was never even really on my radar beyond maybe seeing it on rental shelves when I was little kid. Based on that movie, a tribute to ridiculous buddy cop movies and such, I pretty much had my expectations in check when I suddenly realized that this would be perfect for Guy Movie Month. 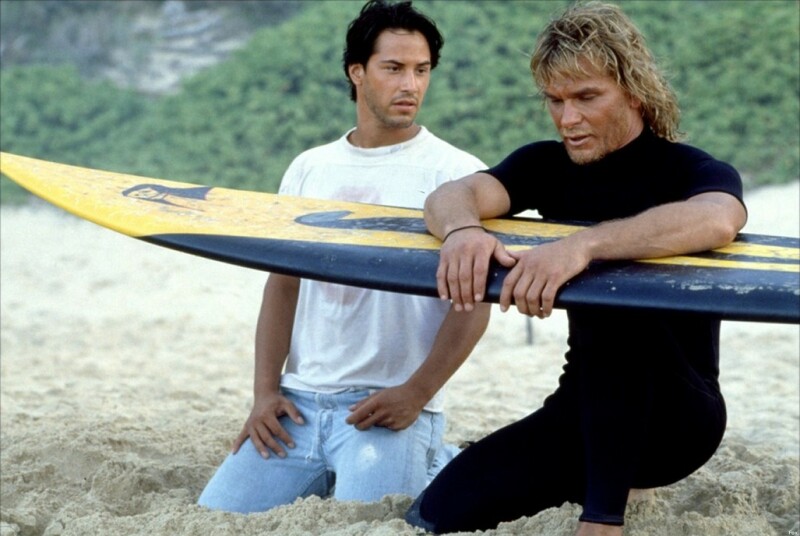 This movie demands suspension of disbelief based solely on the fact that it wants you to buy into the idea of Keanu Reeves as a novice cop going undercover as a novice surfer and poking fun at the surfer lifestyle. There’s just something so… meta… about watching Reeves poke fun at surf lingo in an exaggerated surfer voice. This was just 1991, but it was also right after Bill & Ted’s Excellent Adventure, so it’s not like they didn’t have precedent to go by. Anyway… yeah, don’t take this movie about surfer criminals and the cop who goes undercover to infiltrate and expose them as bank robbers who dress up like ex-presidents too seriously. This is not a very serious movie, but it tries to be. Or at least pretends to. That’s not to say that it’s a bad movie, however. It’s actually quite entertaining, and someone smart was definitely behind the camera (Kathryn Bigelow, future director of such serious fare as The Hurt Locker and Zero Dark Thirty). I can completely understand the (drunken) affection expressed for the movie in Hot Fuzz. There are moments in the film that are brutally choreographed and will put you on the edge of your seat but are so over-the-top ridiculous. And even if you stop to think about it, if you can enjoy the movie for the silly, guy-bonding melodrama that it is, you could still find it pretty entertaining. This is a movie where one of the dudes jumps out of a plane without a parachute just to seek out vengeance. Logic is thrown out in this movie, and in its place is audacity and quirky life philosophies. I’m kind of okay with that. For a buddy film, however, it’s funny then that, if there was any primary point of contention I may have, it’s that it never sufficiently builds up the friendship between Keanu’s cop character, the wonderfully named Johnny Utah, and Swayze’s golden-locked philosopher-surfer, the also wonderfully named Bodhi (as in “bodhisattva” – whether or not this is a nickname is not really clarified nor important). 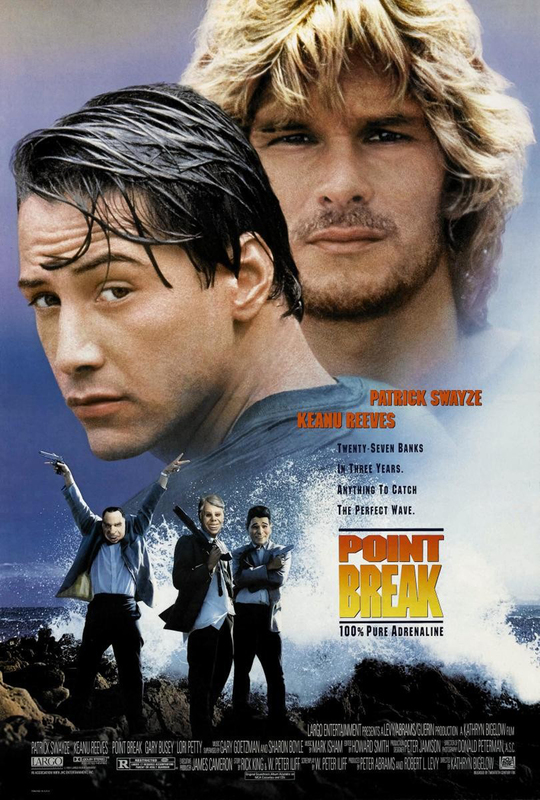 Most of the film is concerned with Johnny’s romancing of the tomboyish Tyler, who is actually a woman and is Bodhi’s ex-girlfriend – though they remain friends because they are both so connected to their surfer philosophies and, thus, are at peace with one another. Or something. Performances are solid enough, however, with Reeves being more engaging than he’s usually been accused of, and Swayze seems to be taking his task very seriously, resulting in a character who is at peace with himself and his activities, much like Swayze himself must have been. Lori Petty seems to be the only one who is tasked with any real heavy emotions as Tyler, and she’s quite good, too. 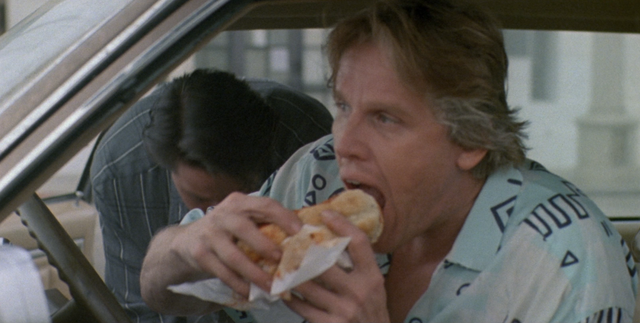 Even the nutty Gary Busey is putting on a good show as the angry, soon-to-be-retired veteran cop mentoring newcomer Johnny Utah. And whenever action sequences go down, all the actors involved seem to give it their all. I have no idea how much of the stunt work was done by the actors, what with all the violence, surfing, and skydiving. Hats off to them, the stuntmen, and the rest of the filmmakers for making it all so oddly entertaining as it is. That ending will leave you scratching your head, if only because it’s just so profoundly out of touch with reality… but in a good way, I guess, is what I’m trying to say. 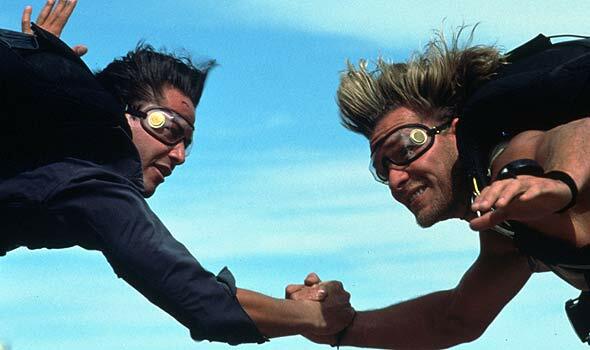 Point Break isn’t high art, obviously, but it’s hard to fault it for succeeding so adequately with its high concept and improbable ambitions.